I’ve been to The Tea Cosy in The Rocks many times, and if I wasn’t in the habit of sniffing out new places to have scones, I would be visiting a lot more often. This time round, I take a gluten-free friend who is literally gagging for a scone fix to try The Teas Cosy’s gluten-free offering. It is important however to pre-order as there isn’t always a batch of gluten-free in the oven. The place is literally pumping out scones to a full house, and even though there are a couple of parties upstairs, we nab the last table for two downstairs. There are four flavours today including one savoury. I go with a currant and an apple crumble scone, which are not long out of the oven; crispy on the outside and fluffy on the inside. 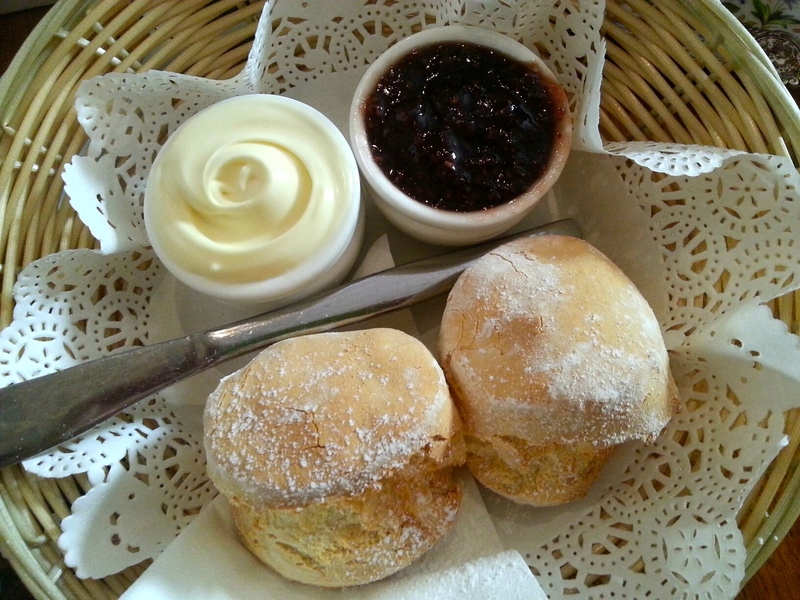 There are nine flavours of Hanks jam to choose from and have the blood plum, which is rich and fruity and goes perfectly with the fresh scones and double thick cream. My gluten-free buddy is lost for words, but manages a “the best scones I’ve ever had.” So as a gluten gal, I suppose she means that they don’t taste like cardboard and are crispy on the outside and fluffy on the inside – just like mine but gluten-free. Nestled in beside the popular Mercantile Hotel in The Rocks, The Tea Cosy spills out onto the footpath and a blackboard sign announces the time when the last batch of scones were baked, or if you’re lucky, when they are coming out of the oven. On Thursdays and Fridays they have three flavours with an extra one (usually a savoury) available on weekends. It’s all about the scones and the tea cosies, and depending on how hungry you are, in addition to the Devonshire Tea, they offer a High Tea. As the namesake suggests, the place is littered with tea cosy covered teapots. All tea cosies are for sale, apart from the one on your pot, or you could always ask. Open Thursday to Sunday. Tea: 19 varieties of loose-leaf teas served in a tea cosy covered pot. Overall: For tea, tradition and tea cosies – where else is there?